Substance abusers present a direct threat to the safety and well-being of colleagues and the general public. This is of particular concern in the aviation industry, where people's lives are on the line each and every day. For this reason, the Federal Aviation Administration (FAA) requires supervisors of FAA-covered employees to take a reasonable suspicion training course on recognizing signs and symptoms of drug and alcohol use and initiating reasonable suspicion testing. 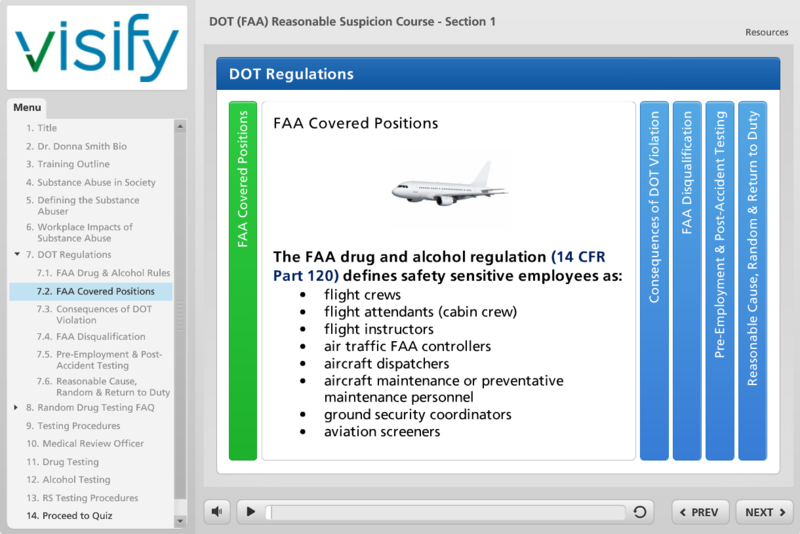 In addition to helping you comply with FAA training regulations, this course will give your supervisors practical reasonable suspicion intervention instructions, including tips for confronting the employee and executing required testing in a timely manner.